The Legend of Spyro: A New Beginning is the first game in The Legend of Spyro trilogy, a reboot to the Spyro the Dragon series, developed by Krome Studios of Australia for the PlayStation 2, Xbox, Nintendo GameCube and Game Boy Advance systems and Amaze Entertainment with a separate version for the Nintendo DS. 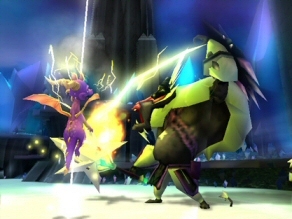 Spyro is seen fighting a soldier with an electricity move. 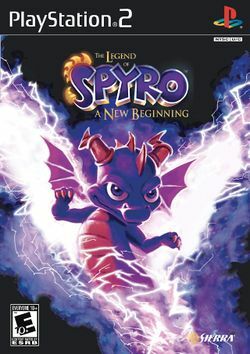 The Legend of Spyro: A New Beginning uses a more action-based focus than previous Spyro games, with a limited use of Spyro's gliding ability and less based on collecting items and playing minigames. Instead of this, Spyro has a variety of combat moves as well as four different breath attacks: fire, electricity, ice and earth, which he can use as both long range and short range attacks. Spyro can also use furies, which are huge blasts of elemental energy. The game has fewer levels than previous Spyro games, with six levels that progress from a starting point towards a final destination and boss encounter in a linear fashion, and two rail shooter style flying levels adjoining them. This page was last edited on 28 March 2010, at 23:07.